Why introduce so many different hives? A saying from the Balkans, "The beekeeping is a trade, and the beehive is it's tool" says a lot about the importance of a beehive. As it is the case with all the other tools, you really can not expect that only one tool, such as a beehive, can do a perfect the job for every beekeeper, and every environmental condition. That is particularly true for the backyard beekeepers, who often can't benefit from a helping hand of others to lift heavy supers, and whose apiaries are mostly stationary and have no choice but try to make the best of the environment they have at their disposal. For too long time the only hive commercially available in North America was the Langstroth hive, which is a relatively good industrial hive, but have quite a few undesirable characteristics, especially for the backyard beekeeping, and our harsh Canadian climate. The heaviness of the deep Langstroth supers led the beekeepers and the beekeeping industry to introduce another two sizes of supers and an eight - frame version of the hive, making the management of the Langstroth colonies bordering impractical (due to having two size of the frames in the same hive, or incompatibility between 10 - frame and 8 - frame elements). ​ The Apiguru Inc. is the first one in North America to offer more than two-three types of hives that can fit all kinds of beekeeping styles and every possible environment out there, especially fitting our own northern climate. We offer something to the beekeepers that was lacking in the North America, a true option to chose the hive that they'll be comfortable working with, and in all cases that are better hives for the bees themselves compared to the stock Langstroth 10 - frame hive. All of our hives are made of 7/8" thick softwood lumber in our own workshop. 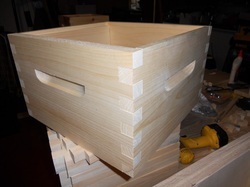 We don't grade the hives, but we are happy to keep the gnarliest and knottiest boxes for our own use (we like the hives with character :) ), and sell the better looking hives out. As far as we are aware none of the hives we offer are patented, and none of the hives are our own invention, although in most of the cases the combination of the hive elements and the design details are tailored by us to achieve a specific goal for the general purpose we wanted to introduce a particular hive for.